The work of the modern, mobile workforce is no longer confined by place or by time. Mobile computers, wireless networking, and always-available online services allows for work to get done just about anywhere and at any time. For the modern IT Manager, this way of working offers new challenges and new opportunities. IT services for the modern, mobile workforce should be on-demand, secured for access on public networks, and offer autonomy for users. 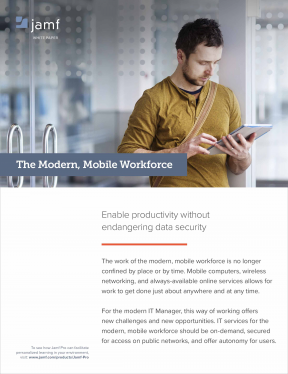 In this enterprise brief, we show why Jamf Pro is the ideal enterprise mobility management solution to manage Apple devices and enable today's modern, mobile workforce.